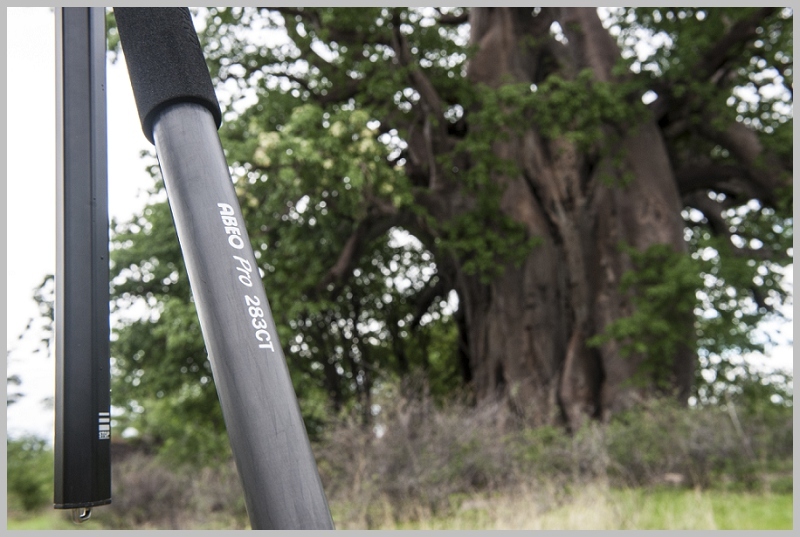 Product review of the Vanguard Abeo Pro 283CGH Tripod crafted after putting this beast to the test during my expedition to Botswana and Namibia. 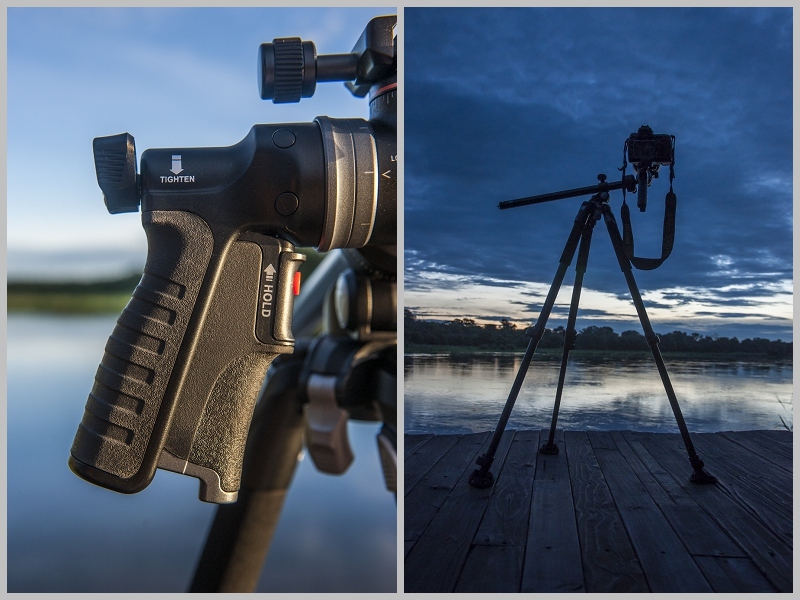 This Pro Kit by Vanguard, consisting of the 283CT tripod combined with a 300T “pistol” grip head, is innovative, versatile and flexible. 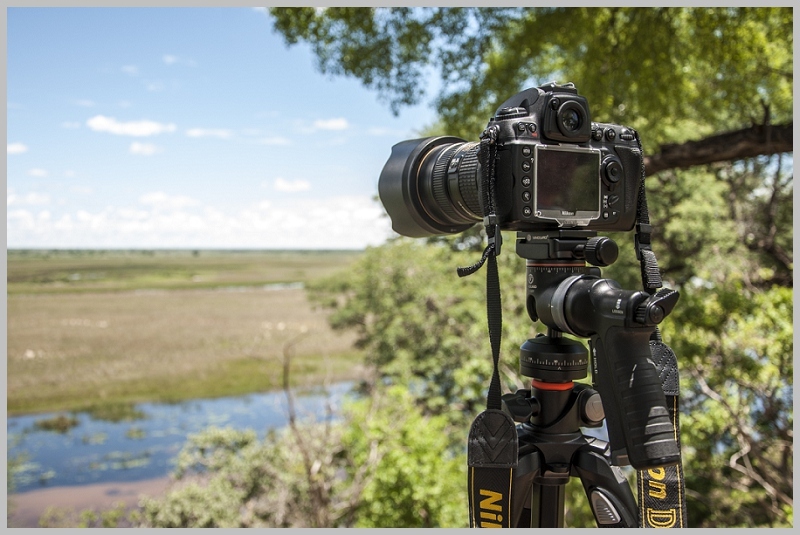 With numerous nifty features and gadgets, this tripod took a little getting used to, but once you get the hang of it you will find them all very useful! 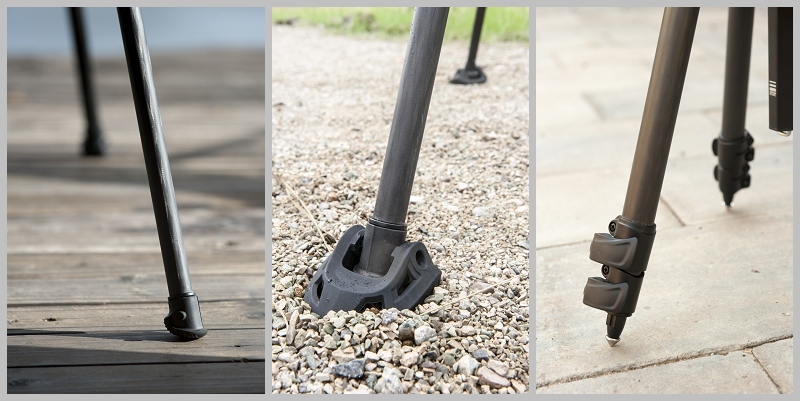 Constructed from carbon fire, the product is solid and secure, just as a tripod should be. 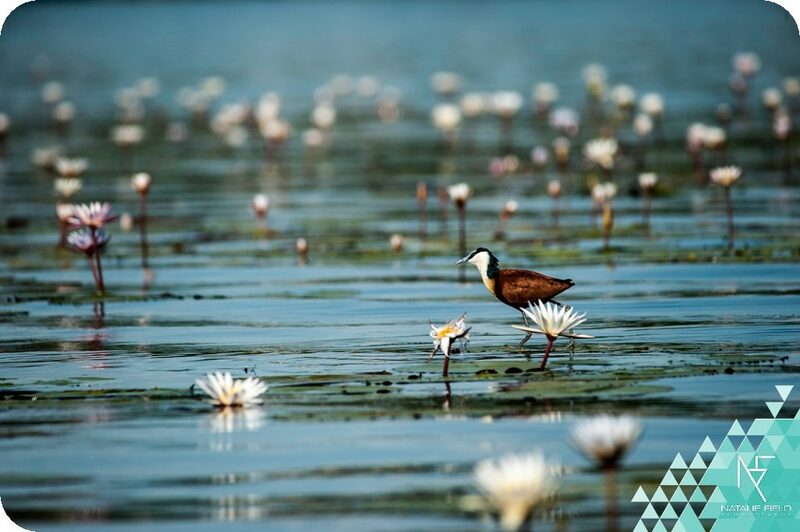 The legs fold down into 3 sections with a maximum height of 171.5 cm when extended. They can be adjusted individually to settings of 25, 50 or 80 degrees and secure in place with a nifty flip-lock found at the top of each leg. I found these buttons to be a bit stiff and this did slow the process of setting up down a little. The legs are covered with foam for good grip under all weather conditions, which also makes it more comfortable to carry or throw over your shoulder. And to finish it off it comes with three different foot options: rubber, spike and snow/sand shoes, making it user friendly on all terrain. The ball head with pistol grip has a few interesting features. The tripod plate with Arca-Swiss compatible mount slides in with ease, and although I was initially weary it seems to be held in place securely even at interesting angles. I was very impressed with the handy tool provided for attaching the plate to the camera. Gone or the days of searching for a coin! With two bubble levels for portraits and landscapes respectively, it is easy to set up a level shot. 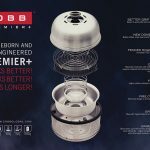 Set above the grip is the first of two panning mechanism, with a 72 click point base rotating a full 360 degrees you can now create more precise panoramic. The second mechanism set below the grip allows for smooth panning for following action shots and video. The grip itself is made from rubber and offers a comfortable feel. The position of the grip itself is interchangeable, but I personally find the vertical orientation works best. The tighten/loosen switch took a bit getting use to as I instinctively tried to simply release it with the grip every time. Set to ¾ of the way one is able to use it with smooth motion, but is best set to tighten for a stable shot. On the front of the grip you will find a hold switch with orange trigger button which allows you to trigger the camera remotely and fire straight from the grip. The cables to connect are supplied with the tripod and are compatible with various makes and models. The center column itself moves only up and down, and has a hook at the bottom to add weight for further stability. But the best attribute of the Abeo Pro is Vanguard’s “instant swivel stop-n-lock” function. The ability to loosen the center column by undoing the orange tab and reattaching it in a horizontal position presents a pivoting column covering 0-180 degree angles in variable vertical and horizontal positions. 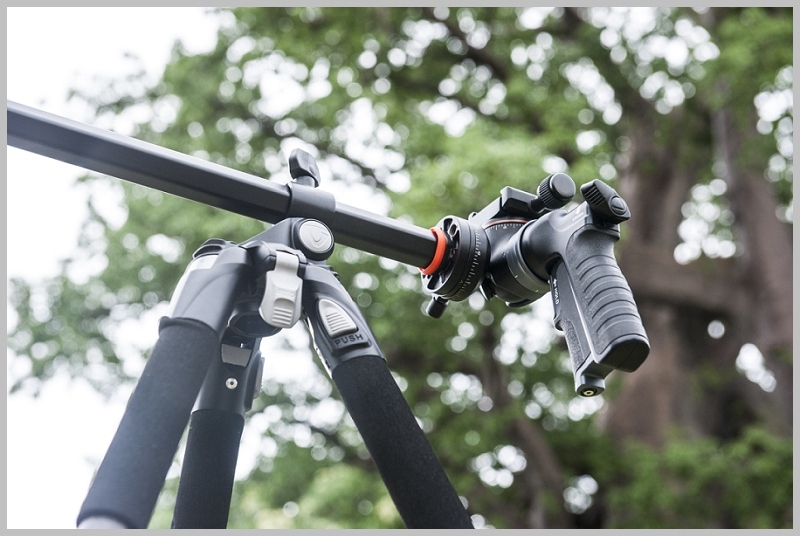 With the ability to open the tripod legs to individual settings and 360 degree views on both the vertical and horizontal axis, the Abeo Pro 283CT offers absolute freedom to cover every angle imaginable. It is no wonder it won the 2013 Tipa and Red Dot Awards.